00:41 | Prime Minister General Prayut Chan-o-cha yesterday said he is hopeful that the establishment of ‘safety zones’ in the Southern border provinces later this month will bring peace, safety, security, and confidence back to the people. Cho-airong District in Narathiwat Province will become the first so-called ‘safety zone’. 01:39 | Constitution Drafting Commission (CDC) head Meechai Ruchuphan said yesterday he expects to see many new faces in Parliament after the 2019 Thailand general election. He said he believes this is a good sign that Thai politics is moving forward. Some 90 groups have already submitted requests and related documents to form a political party for elections tentatively scheduled for February 2019. 02:32 | Deputy commerce minister Chutima Bunyapraphasara said yesterday that Thailand is prepared for a possible trade war between China and the United States, but has not yet felt any impact of the US-led air-strikes in Syria. She said the ministry is currently looking for new markets for exporters and has prepared measures to prevent an influx of goods into the country, which the ministry suspects will happen if the US-China trade dispute turns into a full-blown trade war. 03:43 | Deputy minister of Agriculture and Cooperatives, Lak Wachananawat, yesterday said that the first round of rice production in the 2018/2019 production year will comprise some 9.28 million hectares (about 23 million acres), expected to yield more than 25 million tons of rice. An additional eight million tons will be produced from 1.952 million hectares (4.823 mln acres) of rice fields in the second round. Meanwhile, despite government warnings not to do so due to low water levels, farmers in several provinces have been found to be growing off-season rice, unlawfully taking water from local water sources in the process. 06:16 | The Government Savings Bank (GSB) has introduced a new savings deposit project aimed at state welfare recipients. The tax-free savings deposit programme is among ten low-wage earner assistance projects approved by the Cabinet in January. Welfare card owners can open deposit accounts at any GSB branch and are able to save between Bt100 (about US$3.19), but no more than Bt1,000 ($31.88) each month for five years in exchange for an annual interest rate of three percent. The bank hopes to attract some Bt6 billion ($191.3 mln) in savings. 07:09 | The deputy governor of Uttaradit, Sumit Kertklam, has chaired the opening of a special career building event aimed at increasing public involvement in the implementation of the Thailand 4.0 policy. Gripped by a long-time labour shortage, it was also hoped that the event would help local businesses and entrepreneurs find employees. 08:16 | Volunteers and students from King Mongkut’s Institute of Technology Ladkrabang (KMITL) on Saturday implemented the ‘Next Action’ campaign, in response to the wish of HM the late King to teach Thai citizens about self-sufficiency and sustainable development. Bridges were painted, landscapes beautified, free health check-ups given, in addition to advice on health matters, and educational activities for children. 11:05 | The Thailand Meteorological Department (TMD) has warned that a high-pressure system from China will cause tropical storms in the north, east, south, and central plains, including Bangkok and nearby cities, between April 24-27. Agriculturists have been warned of hailstorms in some areas, and strong winds. 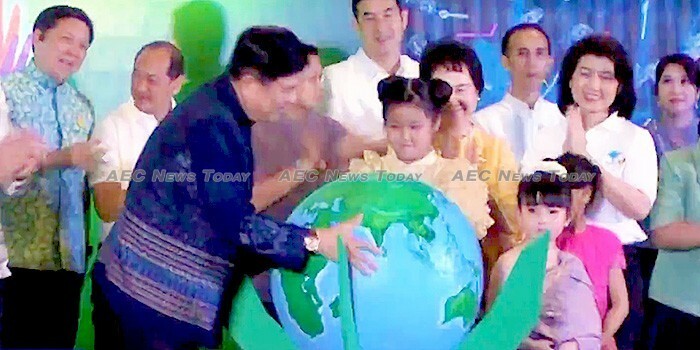 11:53 | The Minister of Natural Resources and the Environment, General Surasak Kanchanarat, yesterday told an event to mark world Earth Day that Thailand accounts for 12 per cent of total plastic waste globally, or some two million tons a year. According to General Kanchanarat only 500,000 tons of plastic waste is recycled each year, with some 1.5 million tons buried, burnt, or left in the environment. In 2017 Thailand was ranked sixth for a second time for the excessive amount of plastic waste finding its way into the sea. 13:11 | Newsline takes a look at the National Electronics and Computer Technology Center’s (NECTECs) FAARM Series project aimed at developing innovative Thai agricultural technology products to improve quality and yield as part of Thailand’s aim of being the world’s kitchen. 17:06 | Rubber tree growers who participated in an income enhancement project in Thung Wang sub-district of Songkhla province have been told to apply the late King Bhumibol Adulyadej ‘s self-sufficiency philosophy and grow edible plants to improve their income. 18:15 | The government of Bali, Indonesia, declared a ‘trash emergency’ early this year, implementing daily beach cleaning with heavy machinery and hundreds of people across the island. The second largest contributor of plastic waste in the oceans after China, Indonesia environmental groups have been calling on the country to tackle what they are calling an “environmental crisis”.